With its perfectly round body, black and white coloring, and peaceful vegetarian nature, the giant panda (Ailuropoda melanoleuca) has been a worthy ambassador from China to other parts of the world. Since China is a huge country, it is important to discuss exactly where pandas live there. The fact is the giant panda's habitable range is becoming smaller and smaller. Even in ancient China, the giant panda was hard to find. It used to live in the lowlands. 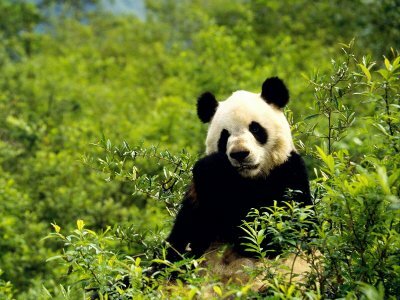 However, human habitation pushed the giant panda out and now it only lives in the Gansu, Sichuan, and Shanxi provinces, which are found in the middle of the country. This is only a bit less than 30,000 square kilometers. Experts believe that fewer than 2,000 pandas still live in the wild. The giant panda’s rarity probably has something to do with the fact that it basically only eats bamboo and therefore needs to live in the cool and cloudy temperate forests where bamboo grows abundantly. These forests are at elevations that range from 3,937 to 12,795 feet. The forests are not only good habitats for bamboo, but they are also ideal for deciduous and coniferous trees. The panda uses the trees to sleep and rest and will also live in caves found in the mountains. During the winter the panda can be found in lower elevations. About 300 pandas now live in zoos and other places dedicated to preserving and breeding them. There, they not only live on bamboo, but they are also fed sugar cane, carrots, sweet potatoes and special biscuits with a high fiber content.